Development of Lyrical Style One important aspect of trumpet study is the development of a beautiful sound and applying that quality to the performance of melodic lines. Etude material that focuses on the development of this skill is used by trumpet players at all levels. Studies such as the Concone Vocalises, Philip Snedecor’s Lyrical Etudes, and the Bordogni Vingt-quatre vocalises are examples of widely used lyrical etudes. This set of etudes for trumpet based on liturgical plainsong provides additional material for study of lyrical style, and presents an opportunity for experience with modal melodies. The Art of Plainchant Plainchant is the monophonic chant used for worship services since the earliest days of the Christian church. As a means of prayer in the service, plainchant was at first maintained by oral tradition, and later preserved in written notation that became standardized around the 11th and 12th centuries. 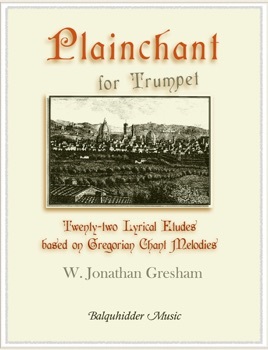 Since the emphasis with plainchant is melodic and the style is smooth and flowing, the genre provides an ideal source of material for creating lyrical trumpet etudes. Much of the study material for trumpet and the other orchestral instruments tends to be presented in major or minor tonalities. The use of plainchant for this set of etudes provides some needed material utilizing the other modes.